If this detox tea didn’t have Senna Leaves in it, I would’ve ranked it a lot higher. I liked most things about it, but ended up having a bad experience because of the harsh laxative effect Senna has on my body. So after trying out this teatox, I give it 2.5 out of 5 stars. I really enjoy the taste, the price, and the fact that they have a great money back guarantee. But like I mentioned, the laxative in this tea is very strong and not pleasant to deal with. I had some bad side effects that you’d rather not hear about. I also experienced lack of sleep at night. They have you drink a cup before bedtime, so that’s why I couldn’t sleep…green tea has caffeine! So overall, I think this slimming tea is pretty average, so I give it a 2.5 out of 5 star rating. 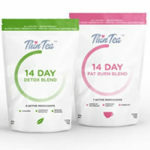 Hyleys Slim Tea come in teabags that are easy to use. The directions say to drink 1 cup a day, preferably at bedtime. I’m a little confused as to why they say bedtime, as this one has caffeine in it. But nonetheless, I followed these instructions. You only need to drink one cup per day, but you should not exceed 3. So it sounds like if you want to, you can drink 2 cups a day. I just stuck with the recommended one cup per day. You need to steep it for 5-8 minutes in freshly boiled water, easy enough! I really like the way this Slim Tea tastes. I tried the Acai Berry flavor, but they have a few other berry flavors on their website. The Acai flavor is pretty light. I thought it would be stronger, based on the smell when I took the bag out of the packaging. It smells very sweet and strongly of Acai. But once brewed, the Acai was a very muted flavor. So it tasted like Acai Green tea, which I really enjoy! Now, for those of you who like overly sweet teas, you may not like this one. It’s not sweet at all, despite how sweet it smells. Hyleys Slim Tea is only made up of three ingredients, which I usually would love the simplicity of it. However, one of the ingredients is Senna Leaf, which is an ingredient I hate. Senna Leaf is a very strong laxative, and is not a healthy ingredient as far as weight loss goes. The other two ingredients are Green Tea, which is a great weight loss/detox ingredient, and Natural Acai Berry Flavor. I just really wish this tea didn’t include Senna Leaf. 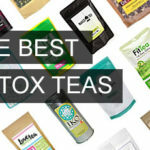 I saw pretty decent results while using this detox tea, but I wasn’t without some side effects from the Senna Leaf. I felt less bloated, which is always a plus. And I lost a few pounds initially in water weight. However, once I stopped using the tea, the water weight immediately came back. This happens because Senna Leaf causes your digestive system to work in overdrive, so you can end up losing a lot of water from how often you use the restroom (not healthy!). So in the long run, I didn’t really experience any weight loss, it just came back after I stopped the tea. I had some unpleasant side effects while using Hyleys Slim Tea. First of all, I was using the restroom far more often than I should be due to the laxative effect. Second of all, I couldn’t sleep at night! I don’t know why they have you drink caffeine right before bed, but to me it’s silly and annoying. 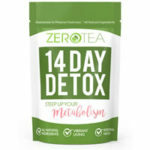 This detox tea is cheaper than your average teatox. It’s $10 per box of 25 teabags, which works out to $0.40 per day. Yes, they offer a 30 day money back guarantee through their website. Which I am SO happy to see. It’s rare that you find a company that stands behind their teas like Hyleys does. 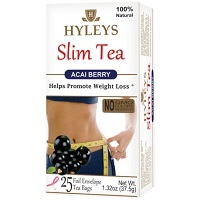 To buy Hyleys Slim Tea, Click Here. Ease of Use Pretty easy to use, drink one cup before bedtime. Taste Tastes delicious, like acai green tea. Results I lost water weight, but gained it back after teatox. Price/Value It’s very cheap at only $10 per box.